It's the Buzzkill Brewers! ~ The Bucky Channel - The World of Sports from Wisconsin's Perspective. 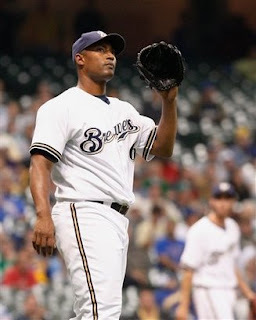 Home » Cincinnati Reds , Dave Bush , Milwaukee Brewers , Salomon Torres , status update » It's the Buzzkill Brewers! I mean, what the hell was that? Giving up a 4-2 in the 9th at home to the Reds was not what I was expecting to see after turning on the game following the great Packer victory. But alas, that was what happened, and said buzzkill ensued. Granted, this team is three games up still on a playoff spot, and that's saying something. But they are playing uninspired ball right now, and there is a reason people are quickly turning their attention to the boys in Green Bay (I'll have a longer piece about that later in the week). One suggestion: Remove Torres from the closer role for Yovani Gallardo. Anyone? That's about all I got on the game, since their next one is about to start in an hour or two. Brewers got the righties going tonight, by the way. Another kudos to Bear for taking care of the Packer recap, well done. As he alluded to, my internet situation is sketchy at best this week as I wrap up my last week in La Crosse. I'll likely make some more posts late tonight, and then we should be back on track. I'm not as worried about Torres as I am about Gagne/Riske/Mota. I'd but Gallardo in that spot. Or, I suppose you'd have the same effect giving Gallardo the ninth and putting Torres in that spot. talk more about the packers that game was awesome.